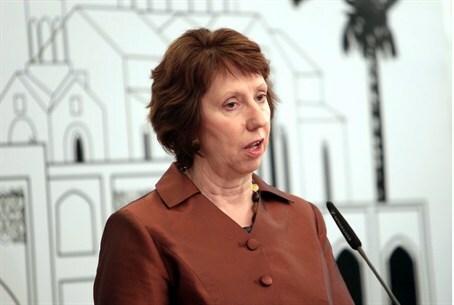 European Union’s High Representative for Foreign Affairs and Security Policy Catherine Ashton said Sunday there is no guarantee for the achievement of a final nuclear agreement between Iran and the six world powers. Speaking at a Sunday press conference with Iranian Foreign Minister Mohammad Javad Zarif, the EU foreign policy chief described the ongoing nuclear negotiations as “difficult” and “challenging,” and noted, “There is no guarantee we’ll succeed” – reported Iran's PressTV. Iran and the six world powers – the United States, China, Russia, France, Britain and Germany – clinched an interim nuclear deal in Geneva, Switzerland, on November 24, 2013. The deal took effect on January 20. Experts from Iran and the six countries, who ended their latest round of talks on Friday in Vienna, are working to hammer out a comprehensive deal following the Geneva accord. The next round of the high-level talks between Iran and the six other countries is to be held in Vienna on March 17. “I think it is very important with the support of the people of Iran for the work that is going on by the minister (Zarif) and his team and with the support of the international community for my work that we should aim to try and succeed,” Ashton pointed out. Ashton, heading a politico-economic delegation, arrived in Tehran on Saturday and was welcomed by Iranian Deputy Foreign Minister for Legal and International Affairs, Abbas Araqchi, at Mehrabad International Airport. During her visit to Iran, Ashton is scheduled to meet with high-ranking Iranian officials, including President Hassan Rouhani, Foreign Minister Mohammad Javad Zarif and Majlis Speaker Ali Larijani. Prime Minister Binyamin Netanyahu called on Ashton to ask her hosts about the weapons shipment Israel intercepted on Thursday.